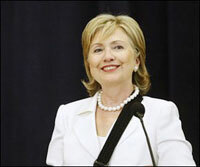 Secretary of State Hillary Rodham Clinton said on Friday that the proposals offered by the Israeli government to ease a diplomatic row with the United States were "useful and productive," and that the Obama administration would continue talks in Jerusalem and Washington. Neither side has characterized the steps outlined in a call Thursday night to Mrs. Clinton by Prime Minister Benjamin Netanyahu. But Mrs. Clinton’s response signaled the United States was eager to lower the temperature in a dispute that began two weeks ago, after Israel announced a housing plan for Jews in East Jerusalem during a visit by Vice President Joseph R. Biden Jr, according to a report in The New York Times. According to The Wall Street Journal, the Quartet—which brings together the U.S., Russia, the European Union and United Nations to promote Mideast peace—also called for the formation of a Palestinian state within two years, appearing to endorse for the first time a similar timeframe put forward by the Palestinian leadership. The Quartet's leadership stressed in Moscow on Friday its continued goal of bringing Israel into direct peace negotiations with the Palestinians, with the intention of creating an independent Palestinian state. The Israeli government's announcement last week that it was sanctioning the building of 1,600 new Jewish homes in East Jerusalem has fueled the sharpest diplomatic feud between the U.S. and Israel in decades. Israel made its announcement during the visit to Jerusalem of U.S. Vice President Joe Biden, fueling U.S. claims that Mr. Netanyahu's government sought to publicly defy the Obama administration on the building issue. The international Quartet of Middle East peace mediators has called on Israel to freeze all settlement activity. UN Secretary General Ban Ki-moon said Israeli-Palestinian talks should lead to a peace agreement within 24 months. Senior US, EU and Russian officials have met Mr Ban in Moscow to try to push forward the stalled talks, BBC News reports.